If you’re considering dentures, you probably have a lot of questions about the different types, the process of getting fitted, and how they’ll feel. 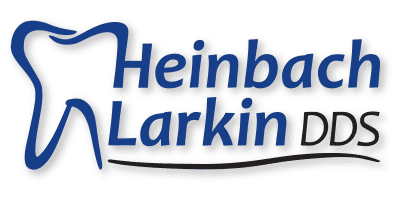 Please don’t hesitate to contact the dentists at Heinbach-Larkin Dental. They have extensive experience fabricating and fitting dentures and welcome the opportunity to evaluate your dental needs. If you have any questions, contact one of their offices in Topeka and Lawrence, Kansas, or schedule an appointment online to learn more about dentures. What are the advantages of implant-retained dentures? Dental implants are titanium rods that are surgically placed into the jawbone. After insertion, bone grows around the rod, holding it securely in place. Overdentures have plastic clips that snap onto the implants. The implants stabilize the dentures and prevent them from slipping. Implants are usually used for lower dentures because upper dentures don’t need the extra support. However, your provider can place them in both the upper or lower jaw. When you need dentures, the first step is a thorough dental exam including digital X-rays to get a complete image of your teeth and jaw bone. The next step is tooth extraction if you have teeth that require extraction. Your dentist at Heinbach-Larkin Dental also takes an impression of your mouth. That's crucial since the dentures are going to rest right up against your gums. They make the impression after your gums have time to heal following tooth extraction or implant surgery. It’s important to wait for complete healing before getting fitted for permanent dentures because the shape of your gums and bone changes throughout the healing process. Dentures fitted before healing may not correctly fit after the gums heal. How do you care for dentures? Just like your natural teeth, dentures need regular, daily care. They should never dry out, so when you take them out at night, put them in water or a soaking solution. Even if you soak them, they should still be brushed daily to help prevent staining and thoroughly remove bacteria. Implant-supported dentures should also be removed daily so you can clean both the dentures and your gums.